vanbucy has no other items for sale. Lot Luhr Jensen K-16,K-14 HELIN M2,F6 w/Box. Vintage Flatfish Fishing Lure. 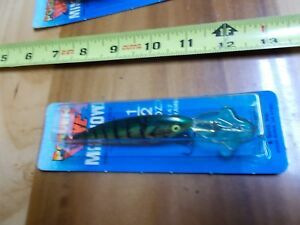 Luhr Jensen Crankbait Pre Rapala Speed Trap Crystal Brown Mud Craw 1/8oz RARE! LUHR JENSEN Herring Dodger Fishing Lure Pack Of 7 Brand New!!!! !